To Cite: Malek A, Rakhshanizadeh F, Sasan M S . Brucella Endocarditis Along with Leukocytoclastic Vasculitis in a Child: A Case Report, J Compr Ped. 2018 ; 9(4):e77347. doi: 10.5812/compreped.77347. Brucella endocarditis occurs in less than 2% of patients with brucellosis, it is the most common reason of death among these patients. Considering the difficulty in the diagnosis of endocarditis and its dangerous side effects, knowledge and awareness about this disease seems to be necessary. 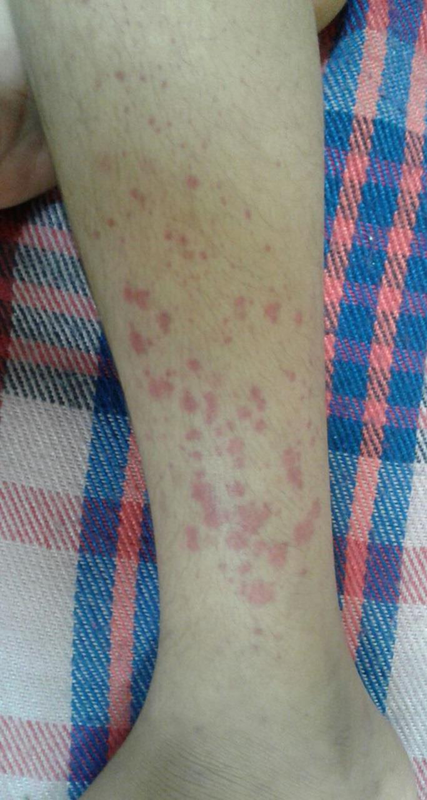 This case report introduces an eight-year-old girl who has referred to the Emam Reza Hospital, Pediatric ward, Mashhad, Iran, with complaints of fever, body pain, and skin rash. In our investigations, Brucella endocarditis, along with leukocytoclastic vasculitis was determined. According to our best of knowledge, similar case of Brucella endocarditis and leukocytoclastic vasculitis, simultaneously, has not been reported in childhood. Brucellosis is the most common zoonotic infection in the world caused by the Brucella species (1). Brucella is an intracellular gram-negative pathogen that is transmitted through direct contact with body fluids of infected animal and more commonly by using unpasteurized milk (2). This disease has a worldwide geographical distribution, however, it is endemic in the Mediterranean zone, Middle East, South Asia, as well as Central and Middle America. In these areas, brucellosis is one of the most important community health problems (3) and 1/3 of all cases are seen in children. Fever, sweating, and arthralgia are the main symptoms among children, though few patients show dermatological manifestations (4). Endocarditis is a rare complication, however, it is the most common form of cardiac involvement in brucellosis and major cause of death in these patients. The diagnosis of Brucella endocarditis is very difficult and requires strong clinical suspicion according to regional epidemiological pattern (5). In this case report, we share our experience on endocarditis and leukocytoclastic vasculitis as a rare skin involvement of brucellosis in children. The presented case is an 8-year-old girl who was referred to our center at Emam Reza Hospital, Pediatric ward, Mashhad, Iran, with complaints of fever, body pain, and skin rashes, which started from two weeks before referral. Three months before this visit, she was examined due to fever, body pain, and arthralgia and with a diagnosis of brucellosis she was treated with trimethoprim-sulfamethoxazole and rifampin for eight weeks. The disease symptoms were diminished after completion of treatment, however, two weeks after cessation of medications, previous symptoms returned and additionally erythematous rashes appeared in the legs. She also had a history of tetralogy of Fallot, where tetralogy of Fallot total correction (TFTC) and pulmonary valve replacement (PVR) was performed at the age of one and seven, respectively. In the examination during this admission, the fever of 38.5ºC, mild to-and-fro murmur on the left side of the sternal border and splenomegaly were found. Rashes were observed as palpable erythematous papules and purpura on the heels of two legs (Figures 1 and 2). Echocardiography findings showed mild PS, moderate PI (homograft) with no vegetation, and no changes were made to the patient’s previous echocardiography. In laboratory testing, ESR was 74 mm/h, CRP 14.8 mg/dL, RF ++ and Wright test equal with 1:1280 has been reported and Brucella grew in the blood cultures. Skin biopsy revealed evidence of leukocytoclastic vasculitis. Based on Duke’s criteria for a diagnose of endocarditis (6) and Brucella infection evidences, Brucella endocarditis was recognized. All organs can be involved in brucellosis, thus, a wide range of signs and symptoms appeared. Reduced appetite, skin rash, respiratory manifestations, lymphadenopathy, and splenomegaly are observed more in children rather than adults (7-9). Approximately 1/3 of brucellosis cases are present with focal complications. The mean age of Brucella endocarditis is reported to be 55 ± 12 years old (2). There is an underlying cardiac problem in less than 1/3 of these cases (10). Our patient suffered from endocarditis at the age of eight, which is much lower than the reported age. She stated use of unpasteurized milk, and she also had an important risk factor for endocarditis, history of cardiac surgery for tetralogy of Fallot (TFTC and PVR). She had symptoms of fever, body pain, and arthralgia for three months before this, referring that with diagnosis of brucellosis and receiving standard treatment all of them were resolved, then again with the cessation of the medication, previous symptoms returned and new complaints appeared. We do not know whether she has been suffering from endocarditis since the beginning and has not been diagnosed at first or endocarditis developed later in course of the disease. The prevalence of skin symptoms are less than 10%. Different types of skin manifestations have been reported, however, skin vasculitis is very rare (11). Our patient was presented with palpable erythematous papules and purpura on her legs, which was diagnosed as leukocytoclastic vasculitis by skin biopsy. After treatment of brucellosis, skin rashes have also diminished. leukocytoclastic vasculitis (LCV) is a type of necrotizing vasculitis that affects small vessels and can be triggered by viral or bacterial infections such as Brucella. The clinical manifestations of LCV are mostly observed in form of palpable purpura on lower limbs. The coincident presence of vascular leukocytosis and endocarditis can be indicative of accumulation of immune complexes in the body (12). Conventional treatment of Brucella endocarditis includes antibiotic and surgical operation. Although in several studies improvements have been reported with antibiotic therapy alone. In some studies, the lack of left ventricular dysfunction and short-term symptoms (less than two months) are two important factors in response to medical treatment (5). The combination of gentamicin and trimethoprim-sulfamethoxazole is the best treatment regimen for children younger than eight years. In some references, the addition of rifampin is also recommended. For children over eight years old, doxycycline instead of trimethoprim sulfamethoxazole is suggested (9). It is mentioned that the medication should be continued 9 months for endocarditis (13). In our patient, all symptoms disappeared and blood cultures were negative with the use of trimethoprim sulfamethoxazole, rifampin, and gentamicin. Fortunately, surgery was not needed. Medical treatment continued for nine months. After discontinuation of drugs, in a one-year fallow up, no recurrence of symptoms or a new cardiac problem was observed. It is recommended that in endemic areas, brucellosis should be considered as an important cause of endocarditis and also leukocytoclastic vasculitis. 1. Yagupsky P. Pediatric brucellosis: An (almost) forgotten disease. Hot topics in infection and immunity in children VIII. Springer New York; 2012. p. 123-32. 2. Chowdhury MA, El Abbassi W, Najeeb A, Mansoor A. Initial presentation of Brucella endocarditis in a previously healthy eighteen-year-old young man. Cardiology. 2013;125(3):170-2. doi: 10.1159/000350399. [PubMed: 23751913]. 3. Ucmak F, Ucmak D, Bestas R, Anli RA, Adanir H. Acute brucellosis associated with leukocytoclastic vasculitis and splenic infarct. Infez Med. 2014;22(4):326-30. [PubMed: 25551851]. 4. Roushan MR, Amiri MJ. Update on childhood brucellosis. Recent Pat Antiinfect Drug Discov. 2013;8(1):42-6. [PubMed: 22812616]. 5. Esmailpour N, Borna S, Nejad MR, Badie SM, Badie BM, Hadadi A. Brucella endocarditis: A report from Iran. Trop Doct. 2010;40(1):47-9. doi: 10.1258/td.2009.090039. [PubMed: 19850601]. 6. Yagupsky P. Neonatal brucellosis: Rare and preventable. Ann Trop Paediatr. 2010;30(3):177-9. doi: 10.1179/146532810X12786388978445. [PubMed: 20828450]. 7. Baltimore RS, Gewitz M, Baddour LM, Beerman LB, Jackson MA, Lockhart PB, et al. Infective endocarditis in childhood: 2015 Update: A scientific statement from the American Heart Association. Circulation. 2015;132(15):1487-515. doi: 10.1161/CIR.0000000000000298. [PubMed: 26373317]. 8. Dornand J, Gross A, Lafont V, Liautard J, Oliaro J, Liautard JP. The innate immune response against Brucella in humans. Vet Microbiol. 2002;90(1-4):383-94. [PubMed: 12414158]. 9. al-Eissa YA, Kambal AM, al-Nasser MN, al-Habib SA, al-Fawaz IM, al-Zamil FA. Childhood brucellosis: A study of 102 cases. Pediatr Infect Dis J. 1990;9(2):74-9. [PubMed: 2314956]. 10. Reguera JM, Alarcon A, Miralles F, Pachon J, Juarez C, Colmenero JD. Brucella endocarditis: Clinical, diagnostic, and therapeutic approach. Eur J Clin Microbiol Infect Dis. 2003;22(11):647-50. doi: 10.1007/s10096-003-1026-z. [PubMed: 14566576]. 11. Massasso D, Gibson K. Brucellosis mimicking Henoch-Schonlein purpura. Med J Aust. 2007;186(11):602-3. [PubMed: 17547552]. 12. Hung JT, Yang YH, Hsiao CH, Yu HH, Lee JH, Wang LC, et al. Leukocytoclastic vasculitis with severe cardiac involvement in an infant: A case report. Clin Rheumatol. 2008;27(7):945-7. doi: 10.1007/s10067-008-0872-6. [PubMed: 18368289]. 13. Keshtkar-Jahromi M, Boroumand M, Razavi SM, Gholamin S, Haghighat B, Hashemi MJ, et al. Brucella endocarditis, a report of 14 cases (1991-2009). J Infect. 2010;61(1):89-92. doi: 10.1016/j.jinf.2010.03.027. [PubMed: 20362000].